There is more going on "behind the scenes" right now than ever before. Lots of stories and experiences--some wonderful, some challenging. I'm working hard on The Power of Moms--really hard--every single day, but I've been going to bed content and waking up excited. Ethan and I went on a bike ride together yesterday, and we explored some areas I've never seen. He wanted to play "Follow the Leader" so we weaved around a vacant parking lot and concrete pillars, and he was all smiles. Alia babysat for me on Tuesday when I went to a shoe-making party for Sole Hope (amazing), but when I left, Spencer was throwing a fit and refusing to take a bath. She said, "I've got it, Mom," and she filled an unused Rubbermaid trash can (that we use to hold water balloons) with water from the hose, added some soap, put Spencer in his bathing suit, and gave him a bath in the backyard. He was totally happy and got clean for bed. I laughed to myself the whole drive to the event. My son is taking a bath in a trash can. This morning I had a headache, and Grace let me rest on the couch while she rubbed my forehead and helped take care of the boys. We gave each other back tickles, and I told her stories from when she was a baby. She said, "I could do this all day." My mom came out and spent the night with us last week. I fixed her oatmeal for breakfast and did my computer work while I snuggled up by her on the couch. We held hands a lot and went purse shopping together. I got choked up when I told her that I want to be with her as much as I can because I just don't know how much more time we have together. She hugged me and told me that she'll never leave me--and even when her life here is over, she'll put in a special request to stay close. I love her more than I can say. Yesterday, Saren sent me a link to this video produced by a church in Whittier. It's based on my blog post "Your Children Want YOU!" and I think Tara did a beautiful job. Eric found the email first and was so excited that he woke me up from my nap so I could watch it. He is so supportive of all this, which is an absolute gift. (1) Penelope Lane is hosting a Mini Blog Conference and Boutique on Saturday, September 29th. I'm going to be speaking about how to make blogging a powerful experience. My dear friend Sarah Hull runs this, and I'm so excited to be a part of it. (2) For the very first time, I'm holding a Mind Organization Workshop in my home. It will be Saturday, September 15th from 9-11:30 am. This is something I've dreamed about for a long time, and while spots are filling up quickly, we still have some space left. Come join me! (3) And finally, Eric and I are hosting a Couples Retreat/Workshop on Friday night, September 28th somewhere in or near Irvine, CA. We're still working on the final details, but this is going to be an amazing date night. I'll post the registration link as soon as it's up. My friend Catherine Arveseth posted this video to her blog the other day, and our house hasn't been the same since. We bought the song on iTunes, and now we are dancing around the house to this music at least 15 times a day. Grace even played it on my iPhone tonight on the way home from Back-to-School Night, and we danced the whole way through the parking lot. 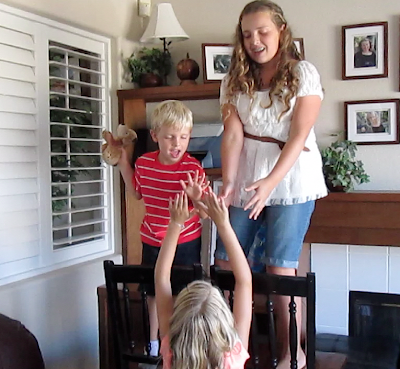 When the kids got home from their first day of school on Wednesday, Alia and Spencer stood up on chairs and danced their hearts out while Grace pretended she was a fan in the audience begging for high fives. Which gave me an idea. What if this cute Kesler Family (or someone else who loves to dance) made "Family Dance" Instructional Videos? Or does anyone know of some that are already out there? I would love to learn simple dances with my children and then get together with other families and dance together. (Flash mobs at the park?) But I'm not a choreographer. And I need some help. It just seems like dancing would help us remember how fun families are. Because even though I had to clean up a smashed jar of maraschino cherries yesterday, and even though someone left the deep freezer open and all the frozen stuff softened, and even though the boys were swinging on the shower rod the other day, families are still fun. Really fun. So I'd really appreciate any help anyone has to offer on this. We could even expand it to our whole Power of Moms Community and have an official "Family Dance Day." I'm getting more excited every minute. . . .
School started today for my children. They could hardly sleep last night, and the anticipation this morning was so cute to watch. But to explain why my heart melted, I need to go back a few years to a conversation I recorded when Spencer (age one) and Ethan (age five) were taking a bath together. I was sitting on the bathroom floor with my computer, and when I heard their sweet dialogue, I started typing as quickly as I could. Ethan: Spencer, will you stay one forever? Will you stay one for me? I'm going to miss you when you grow up. When I'm in 4th grade, you'll be in Kindergarten. And I'll call to you on the playground, and you'll run to me and hug me. And you'll always know me because I'm your brother. Forever we're brothers . . . Forever we're brothers . . . Forever we're brothers, right? That experience was sweet to me then, but now I need to finish the story with what happened this morning. Eric took Alia to middle school (Ahhh! Can't wait to hear how it went for her), and I dropped Grace off in the car line because she was dying to get to her classroom. Then I parked in a neighborhood across the street (too many cars in the parking lot today) and walked in with the boys. Ethan helped Spencer put his shoes on the right feet this morning, and then while we were walking, he said, "Here Spencer, let me put your lunch box into your backpack for you." And then Ethan said, "You can hold my hand." We walked together up to the gate, and then I kissed Ethan and sent him off to find his class. And then I stayed in the Kindergarten room until all the parents had to leave. We read books, did a few activities together, and met some new friends. And then when I walked out the door, I wiped away a few tears and entered this brand new stage in my life--one where I have three and a half hours of quiet time every day. It's marvelous when I think about how much I can get done, but I can't wait to see my children again. Do you love the first day of school?